Red Zatoichi Sword | BUDK.com - Knives & Swords At The Lowest Prices! A samurai sword is as much a work of art as it is a weapon, and that idea is reflected in this fantastic item! Patterned after the weapon wielded by Zatoichi, the famous blind swordsman character of Japanese films and television, this Red Zatoichi measures 38 1/8" in length. 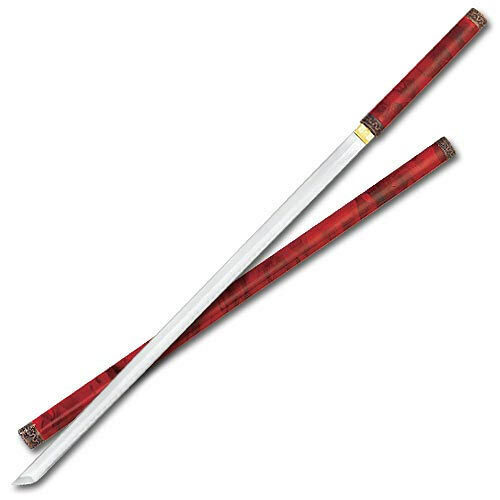 It offers a 28" blade constructed from stainless steel with engraved bronze accents and coordinating red handle and sheath to create an elegant, sleek appearance.